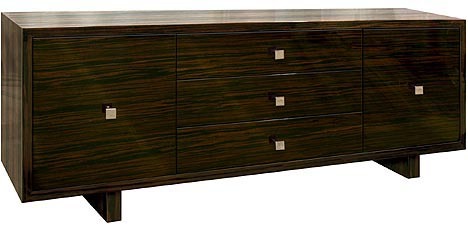 Avantgarde Collection credenza or media console with two doors and three drawers, shown in hand polished high gloss Macassar ebony with polished nickel square pulls, the interior is finished in optional Burgundy color. 72"w x 16"d x 30"h.
Also as a dresser and bedside table. Custom sizes and finishes including interior colors are available.